Nowhere is sacred in the Castle, And Äiti has taken the camera into the bedroom at night. So we cannot sleep in peace! I usually stay at the foot of the bed, for most of the night. I guard this territory well. But this does not stop the others sneaking in. Those with short fur snuggle together. And at this point Äitihas her legs bent at very uncomfortable angles under the cover. And this was taken on the bed, but in the daytime. 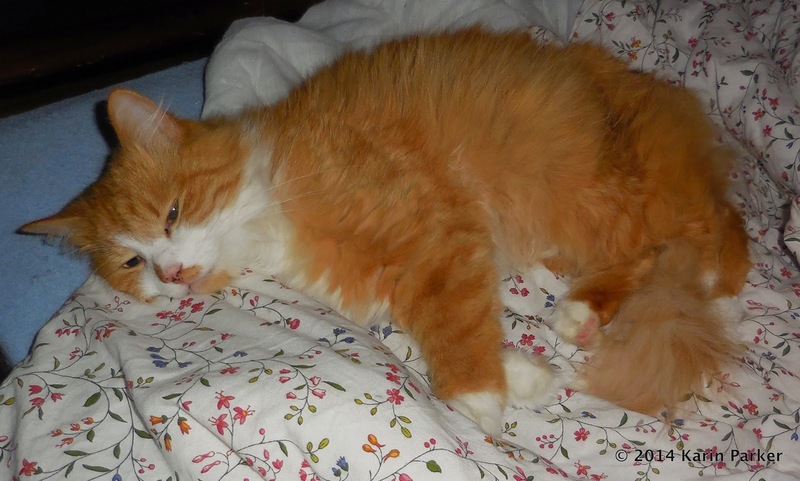 Ruska is a great snuggler - but not with humans. 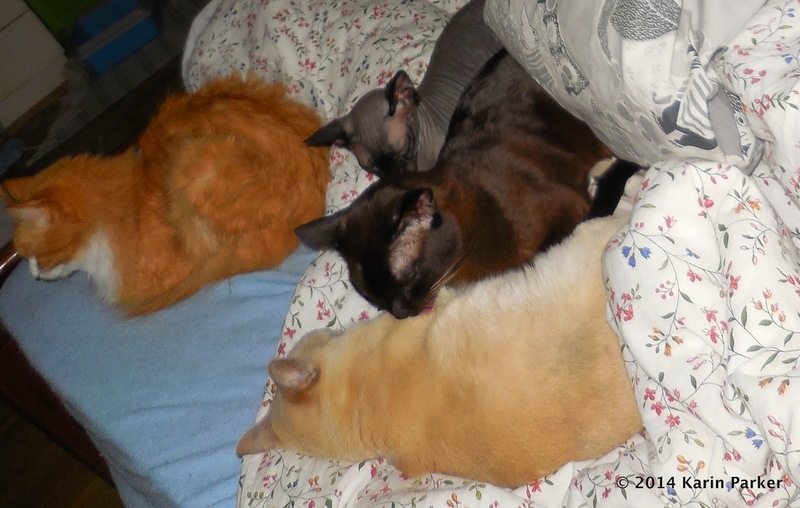 We cant collect in piles as well as you guys, but we do spend the nights on the bed. Mommy is SO jealous! She only gets one or two of us at night--most of us sleep with DADDY!!! and SMOOCHES to Mirsku from May Ling!! There are just three of us, so we each take our own sides of the bed. Lots of times I will sleep next to my human's boyfriend because he generates the most warmth. 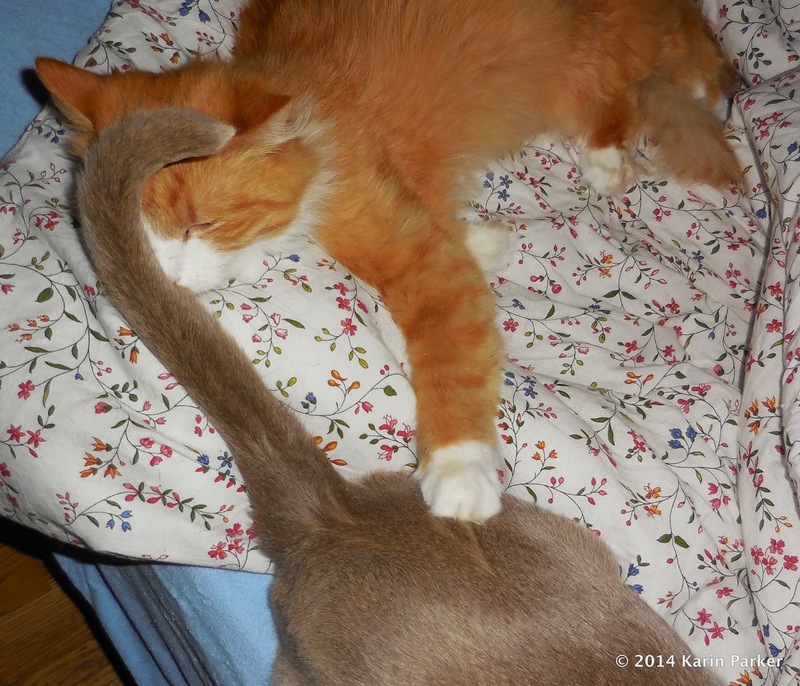 Aaand we all know that Mirsku is a great snuggler! What wonderful kitteh piles. You kittehz will be sure to keep Aiti nice and toasty this winter. We all end up on the bed now, and by morning Mom is usually in some uncomfortable position because we take up most of the bed! That looks like fun, just snuggling and walking all over your mum.